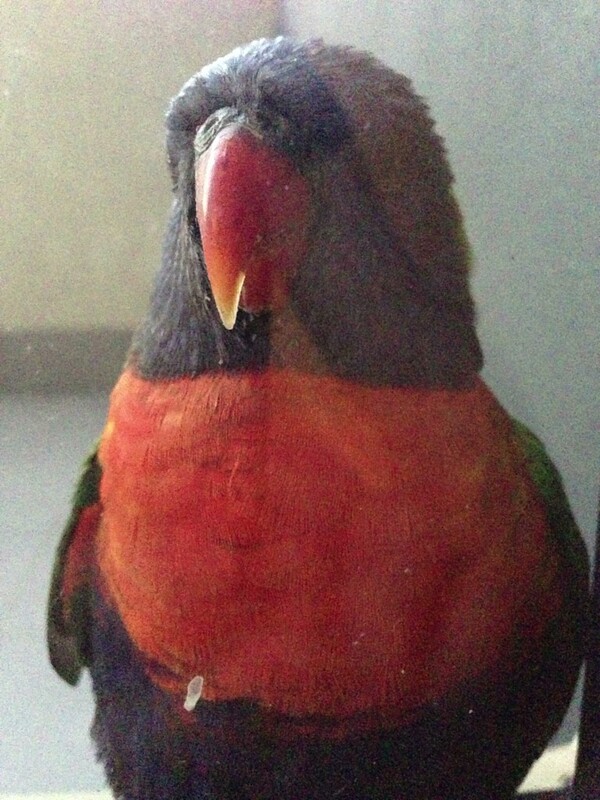 Here is a picture of the rather magnificent bird that crash-landed on our balcony yesterday evening. 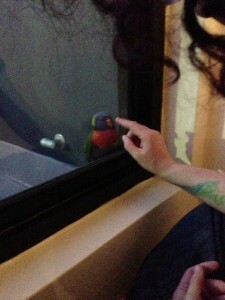 It’s a rainbow lorikeet. It was stunned, so we put out a little water (which it ignored) and a little diced banana (which it ate in a hilariously messy fashion, getting banana mush all over its beak and then slowly licking it off and blinking). Here it is being confused by my finger: After a short while it fell asleep with its head tucked under its wing, and an hour or so later awoke in much higher spirits. It shimmied up and down the window ledge a little, and started making squawking noises at me when I went out to check on it. When we went to bed it was asleep again, and when we woke today it had flown away. I found out about rainbow lorikeets when I was in I guess second year of uni. I loved the way they looked in pictures but I thought I’d never get to see one in the wild, not really. They fly in groups of three and four through Hyde Park, making sounds like squeaking hinges, and they flock in berry-laden trees in the botanic gardens.